Soledad Tanner from Soledad Tanner Consultant is an Alumni and was a panelist in Finance disciplinary focus. 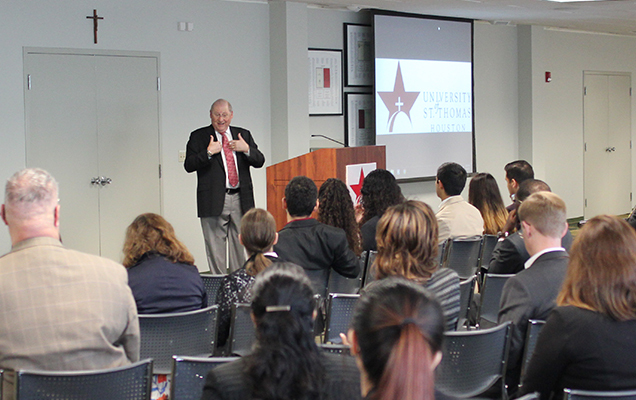 Career Day at the University of St. Thomas-Houston is an annual event that focuses on career development for all UST students. The day offers panel discussions and industry overviews with guest speakers—Cameron School of Business and UST alumni with multiple years of industry experience. This event not only showcases the advantages of a degree from the University of St. Thomas, but it also inspires and guides our current students, offering them the chance to learn how best to leverage their UST degrees towards the career of their choice. Alex Howard shares insight with CSB Students. Career Day 2017, hosted this year by UST’s Cameron School of Business and Career Services, opened with inspirational words from the keynote speaker, Alex Howard, Managing Director in the Valuation & Financial Opinions Group at Stout, Risius, and Ross. Howard shared the progression of his professional career with the audience, urging students to be confident and assertive in going after the job they want, while keeping in mind the importance of organizational fit. Howard also encouraged students to start building their networks early, and to take note of the value of career mentors. Accounting Panelists: Lindsay Fisher, Associate, Compensation & Benefit Solutions; Josh Henke, Director at Compensation & Benefits Solutions; Augusta Karolys, Operations Manager at Braithwaite Global; Julietta Palyan, Assurance Experienced Associate at PwC. Finance Panelists: Arturo Lopez, CEO of AGL Holdings; Soledad Tanner, Soledad Tanner Consulting, LLC; Andrew Graesser, Insurance Agent at State Farm. Economics Panelists: Daniel Quijano, Energy Economist at UT Austin-Center for Energy Economics; Mike Moorehead, Economics and Energy Project Lead at INTECSEA Worleyparsons. Marketing Panelists: Cindy Arzola, Brand Manager at Signet Interactive; Katie Mazzola, PR Associate, Buyer at Francesca’s. Biology/Chemistry Panelists: Jonathan Zalamea, MD; BC Robinson, Principal Consultant at Ramboll Environ; JT Mayo, Senior Chemical Engineer at Schlumberger. International Studies/International Development/International Business Panelists: Daniel Stoecker, CEO of Alliance for Multicultural Services; Joshua Martin, Partner/Institutional Sales and Capital Markets at Heikkinen Energy Advisors; Molly Reyes, Commercial Strategy Manager. The event ended on a jovial note, with a reception that allowed for ample networking opportunities between the attendees. Dr. Beena George, Dean of the Cameron School of Business, believes it is highly important for current students to hear from professionals in different disciplines, industries, and types of organizations on what is available and what is occurring within practice. Additionally, engagement opportunities like Career Day help students to see how successful individuals have excelled in their work and advanced their careers. These insights should help them to set their own career goals and plan approaches to achieve those goals. Finance major, Luis Pardo attended the Finance and Energy panels, and was particularly pleased with the wealth of information he received from one-on-one discussions with several panelists during the networking session.